If an emergency directly affects you, such as an evacuation order – you will be notified by a local authority such as the Linn County Sheriff or by an Alert or reverse 9-1-1 call to your home. Listen to the TV or radio news sources. Or watch for online newspaper articles. The City of Lyons does have a Facebook page, which we will try our best to provide the most current, reliable information available to us. View interactive map of flood data for the state of Oregon, provided by the National Weather Service. Oregon Department of Geology and Mineral Industries (DOGAMI) provides educational information regarding earthquakes and other natural hazards. 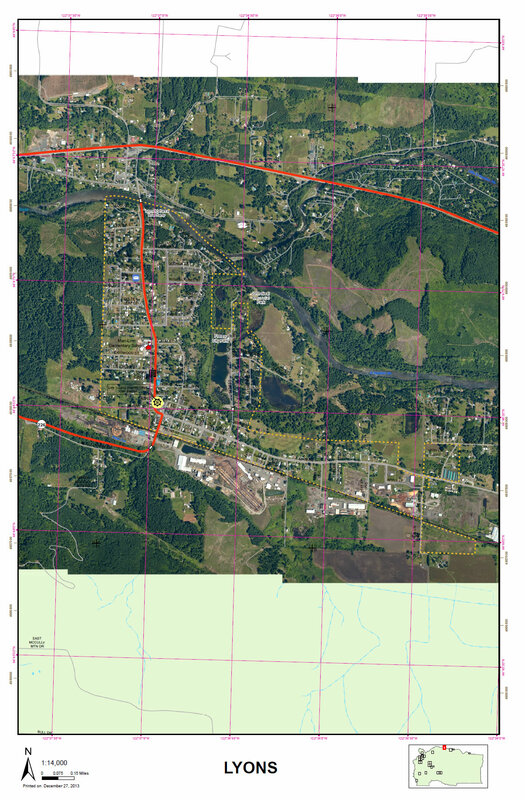 The City of Lyons developed an addendum to the Linn County Natural Hazards Mitigation Plan (NHMP) between June and December 2010. The City’s Addendum received approval from the Federal Emergency Management Agency (FEMA) on June 8, 2011. Formal approval allows the City to apply for federal disaster mitigation funds (see grant program descriptions below under “Why do we need a Natural Hazard Mitigation Plan?”). Note: Mitigation Plans are non-regulatory in nature, and do not set forth new policy. What is a Natural Hazards Mitigation Plan? A natural hazards mitigation plan (NHMP) identifies actions that strengthen a community’s ability to withstand the damaging effects of natural hazards. Mitigation is any sustained action taken to reduce or eliminate the long-term risk to human life and property from natural hazards. Why do we need a Natural Hazard Mitigation Plan? Without a federally and locally approved NHMP, a community is not eligible for the following federal disaster mitigation funds. Pre-Disaster Mitigation Grant Program: provides funds to states, territories, Indian tribal governments, communities, and universities for hazard mitigation planning and the implementation of mitigation projects prior to a disaster event. PDM grants are nationally competitive. Hazard Mitigation Grant Program: provides grants to state and local governments and other eligible recipients to implement long-term hazard mitigation measures and projects after a major disaster declaration. The purpose of HMGP funds is to reduce the loss of life and property due to natural disasters and to enable mitigation measures to be implemented during the immediate recovery period following a disaster. HMGP funds are available to communities within states that have recently received Presidential Disaster Declarations. HMGP funds are prioritized for communities that are directly affected by a disaster, but communities outside of the disaster declaration are typically eligible as well. Flood Mitigation Assistance: assists states and communities in implementing measures that reduce or eliminate the long-term risk of flood damage to buildings, manufactured homes, and other structures insurable under the National Flood Insurance Program. Note: Although Lyons created an addendum to Linn County’s NHMP, Lyons is eligible to independently apply for federal mitigation grant funds. Both jurisdictions may, however, work together in the application process (if a particular project will benefit both jurisdictions). This year student households will be called using the School Messenger system, with calls starting at 5:30 a.m.If no one answers the phone and the household has a message system, it will leave a message. If not, other places parents can look for information on school delays or closures include the District website located at www.nsantiam.k12.or.us where it will be posted on the main page, and on local news and radio stations listed in the student handbook.